I have a bad tendency to let things — paperwork, tasks, laundry — pile up. That's why I'm often not as organized as I should be. By the time I go to put things away, I feel like I'm dealing with clutter so powerful it could defeat Godzilla (I've already started on the screenplay for Godzilla vs. That Pile of Stuff I Still Haven't Put Away Since Moving). From the fridge to the filing cabinet, here are some ideas for organizing your things. Yes, I am telling you to organize your organizing. Make a specific list of what you want to organize — the bookshelf? Your closet? Your drawers? If you have time, start to formulate a plan. Now, when you have a couple of hours over the weekend, you're ready to attack. Masking tape is a great way to create temporary labels for everything from storage containers in the basement to Tupperware in the freezer. Buy a roll of masking tape and a Sharpie, and always keep them in the same place. If you're planning an organizing project, buy any containers or other organizing tools you need now. Just as with making the list, you're now totally ready to tackle the project when you have a moment. Just one. Throw out junk, move things if they belong elsewhere, and neaten up what's left. Have one item that's never put away, even though you don't always use it? Find it a home. Now, when you see something that you want to donate to Goodwill, you can immediately pick it up and put it in the donation box instead of leaving it for later. You don't need to clean the whole fridge at once — just remove any questionable leftovers or past-their-prime condiments. Remove everything you use from your purse, messenger bag, or briefcase. Clean out the dust, and put things back in nice and neatly. Whether it has different slots for everyone in the house or is just a basket that all the mail gets dropped into, stop throwing your letters and bills on the kitchen table. Whether it's mementos, out-of-season clothing, or DVDs you rarely watch but want to keep, pack one storage container. That big pile of photos is daunting. You don't need to organize them all at once, though — scrapbook one page. This is a great activity to do while watching TV. Similarly, if you have a big pile of papers waiting to be filed, just tackle some of them — don't feel like you have to do them all. Give yourself a deadline for getting yard sale items identified and out of the house. Consider asking a friend or neighbor to do the yard sale with you so someone holds you to it. You have less to organize if you simply have less. When you're buying something, ask yourself if you really need it. Read more about this in Kentin's article on the Zero-Accumulation Household. It's important to know where you stand in order to reach your financial goals. Understand your money situation by making these small steps toward getting your funds organized. Whether you open an online savings account or put $20 in an envelope labeled "new couch fund," make a plan for saving. Join a site like Mint or Adaptu that helps you see all of your accounts in one place, or take Craig's financial organization advice and find ways to put more of your accounts under one bank. At work or at home, a disorganized computer can make for a unproductive day. Are all of your files loose in "My Documents?" Create folders for different areas, and move files accordingly. Now that you have those lovely folders, clean off your desktop. I have a chronic habit of downloading files to my desktop and not putting them elsewhere — in fact, I have (gulp) almost two monitors full right now. I'll be doing this one later tonight. If your inbox is piling up with messages you need to reply to, take a few minutes to start chipping away. Feeling inundated with status updates that you just don't care about but read anyway? Hide Facebook updates from repeat offenders. You'll still be friends, but you won't have to read about their disgust and fury every time the grocery store is out of cilantro. 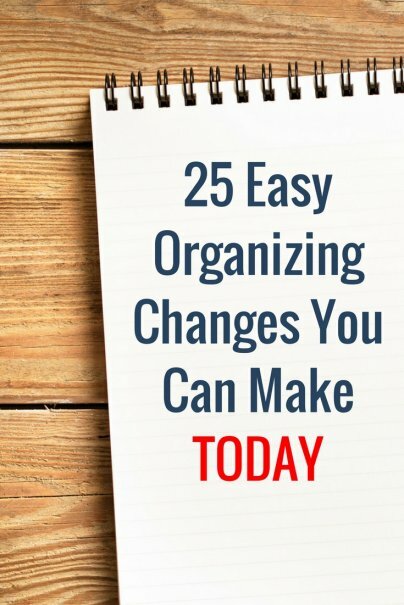 Feel like you never have time to organize? Well, maybe your time is exactly what you need to tackle. Whether you use a spreadsheet or a time-tracking application, better understand where your time is going. Even if you think you don't need it, almost everyone can benefit from having a calendar. I especially love Google Calendar, because it allows you to share your calendar with friends. Being able to see what my close friends are doing makes it easier to plan get-togethers. A calendar won't do you any good if you don't use it. This might seem obvious, but I know plenty of folks who have calendars and never actually look at them. If you have a family or roommates, a chore chart can help you fairly split tasks. And even if you live alone, having a list of chores can help you spread them out over the week. What quick ways to get organized did I miss? Share your thoughts in the comments. I think you've gotten some of your organizing tips backwards. The first thing to do is not to buy more stuff, even if it's storage containers! It's better to get rid of things you never wanted and things you no longer want first. Then everything else might be easy to organize. If not, then you can start looking into additional storage ideas. For when things seem overwhelming, I do like the tip of attacking one thing at a time, such as the t-shirt drawer. This does lead to the problem of having to do everything twice. Because as you work in other areas, you'll find more things that belong in that t-shirt drawer, perhaps so many things that they won't all fit like you thought they did when you first finished the t-shirt drawer. Hey Debbie -- I definitely agree about getting rid of stuff! That's why I suggest creating the donation box and trying to become a zero-accumulation household. Even though the tips were numbered, they weren't necessarily in order. Doing it twice can be a danger with attacking one small area at a time...do you have any suggestions for other ways to approach it that have worked for you? Great tips to get started! I tell my organizing clients to do small things since all baby steps are victories. It seems a little odd that steps 2&3 are "buy something"... this from a site about saving money! Hey Matt -- This is a case where I think buying some key items helps; you can't get organized if you have stuff you want to keep and nowhere to put it or no way to label it. That said, if you can get free or used storage boxes, that's definitely better. I agree - you don't need to buy containers before you start the organizing. Just stop by any grocery store (or Costco) and pick up a few cardboard boxes - trash, keep elsewhere, donate, are my 3 categories. Then go through one area at a time and sort items into each. Once you have your area organized, you'll be in a better position to know if/what kind of containers you need. It may take a bit longer, but you won't buy extra containers or the wrong sizes. Meg, your list includes some great suggestions for getting organized. Other sources for organizing tips have often said that being disorganized costs you money--you can't find what you what and purchase redundant items, you misplace mail that contains checks, documents entitling you to tax write-offs, etc. That being said, I think a small investment in some containers will soon pay for themselves, and good organizational habits can transfer to money management and save you even more money! What has worked for me is to go through the house and collect all of one particular category, for example, papers, or in Debbie's example, t-shirts. Then I can see how many and what types I have. I then purge and decide where to store the rest of that category. Great tips here. I often find myself more annoyed by my digital desktop clutter than the physical clutter on my desk. Making a habit of sweeping your digital desktop can prevent a lot of headaches as it just clears your mind to look at a clean background. For oil stains I have found that Buttermilk works like magic. In fact if anyone has eaten greasy stuff the anser lies in taking some buttermilk. Don't start activity B until you're cleaned up after activity A. It's like a mantra for me. I LOVE this advice (even if I'm bad at following it!). One of my goals is to get better at doing the dishes while I'm cooking instead of leaving them all until the end. A place for everything and everything in its place. What can be more succint than that?